Call it a mighty omen or a natural progression of events, as soon as I finished Thundergod, I happened to lay my hands on Arjuna – Saga of a Pandava Warrior Prince, written by the talented Anuja Chandramouli. It appears as if Lord Indra is indeed raining mythology at scribbles of soul, this week. For the uninitiated, Indra the God of thunderstorm and Rain, is the divine father of Arjuna, the third Pandava of famous Hindu epic Mahabharata. I have already spent sometime in the company of mortal Indra and I was quite missing the good old God Indra in a traditional setting and in a flash, my wish was fulfilled as I began reading Arjuna The Saga. Before, I jump headlong into the summary of present novel, I think a word or two should be said about the first impression the novel Arjuna made on me. Firstly, I liked the way the writer dedicated her novel to Ved Vyas, the original writer of Mahabharata. The venerated writer of the longest poem does deserve a standing ovation and I admire Anuja’s sensibility in acknowledging his work. More often than not, writers dedicate their work to their own family, friends or even their editor, but, seldom do I find an author gracious enough to thank the very source of her inspiration, often masquerading the copied work as their own. Kudos to Anuja, you won my heart by this single act. Secondly, I liked the way a list of characters was placed in the very beginning. Mahabharata is a complex tale with a number of persons. For the first time reader, it may be very confusing to distinguish one from the other. But, the list of names along with a small description proved to be quite useful, as I kept referring to it while reading. Last but not the least, I loved the way, a proper background was given before beginning the actual story about Arjuna. The book, no doubt, concentrates on Arjuna and his adventures, but the prologue actually began with the story of Janmejaya, the great grandson of Arjuna. Janmejaya is a powerful king, the sole successor of mighty Kuru clan. But as he had lost all his male elders in his infancy, he is oblivious of his glorious past and yearns to know more about his family, and particularly about Arjuna, the great warrior. As he curiously bombarded Ved Vyasa with a hundred questions, Anuja laid a solid beginning to her story, where Mahabharata is recited for the very first time by Vaishampayana a disciple of Sage Vyasa. And, thus began the divine saga of Arjuna. Anuja has chosen her main character very wisely. Arjuna is one of the most prominent character of Mahabharata and with him as the protagonist, she could easily narrate the tales ranging from Dronacharya to Krishna to Karna to Ashwathama, without a break. In reality, the book is only titled as Arjuna, but actually it is a miniature version of Mahabharata, even including Puranic Kathas from other scriptures as well. And I simply loved to read all the fantastic stories, the author chose to tell. The book begins with Arjuna’s birth and ends with Pandavas final journey to Himalayas, covered in 21 chapters. But, in between, so many incidents happened and so many stories were narrated that I was literally transformed into a four year old lost in the fairy land, listening to each story as the eighth wonder of the world. The only difference being that this wonderstruck girl actually got inspired to become a relentless story teller herself and for past two days, I have been incessantly mesmerizing my family and friends with my newly discovered pool of Indian mythology. Needless to say, I simply loved the book. It has made me hungry to know more about our past. Though, I know that the present book is only a translated version of our endless mythical tales, just a tip of the iceberg. Our scriptures are too vast to be accumulated in a single work, and though the best way to learn about it is by reading the original Shastras and Puranas, it is hardly feasible in our busy lives. So, Anuja’s Arjuna strikes me as a convenient alternative. And, her exquisite narration does make the exercise even easier. She does a fantastic job in retelling the old stories, complete with frequent usage of archaic words, lending a classic appeal to the novel. Without dwelling on heavy costumes or makeup, Anuja’s well written narrative transported me back into the times of B. R. Chopra’s Mahabharata, when we as kids loved to call our parents ‘Pitashri’ and ‘Matashri’ instead of boring papa and mummy. Though, despite lucid explanation, I did find some stories too long and complex to understand in a single read, particularly the ones involving Uttara and the past lives of Nara and Narayana. May be I faced problems as I was not very familiar with these particular events. But, even this slight niggle actually increased my fascination. It was easy to comprehend the known stories, but the novelty of new ones actually kept me on my toes, making me appreciate the book even more. The Celestial quest of Arjuna and Midnight Massacre by Ashwathama, were the stories of this league and I really enjoyed them. If Thundergod impressed me with its modern take on Indian mythology, Arjuna soothed me with its conventional way of story telling. I guess, Mahabharata is a veritable source of myths and legends that one may never tire of exploring and the present book definitely egged me on to read more. The Saga of Arjuna is one of those rare works that you really want to preserve for future reference and repetitive reading. A commendable job by Anuja Chandramouli. Wish to read more from her. 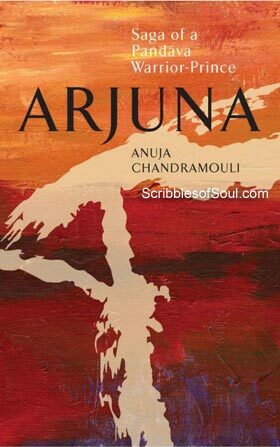 Loved the detailed review on Arjuna! I honestly appreciate it. I look forward to read this book soon. Although, I dont agree to consider Mahabharata a myth which is surely a personal belief and conviction but I do concede to one thing that your review has attracted me greatly towards reading this book. You must read Bhagavad Gita As It Is for sure. It has a great subject matter. Thanks Abhishek, glad you liked my review and I am sure you would enjoy the book even more. As far as Mahabharata is concerned, I also believe in its reality. But, even if someone doesn’t, I think it gives even more credit to Rishi Vedvyas who was able to create such a complex tale out of nothing. So, in both cases Indian mythology has an upper hand.